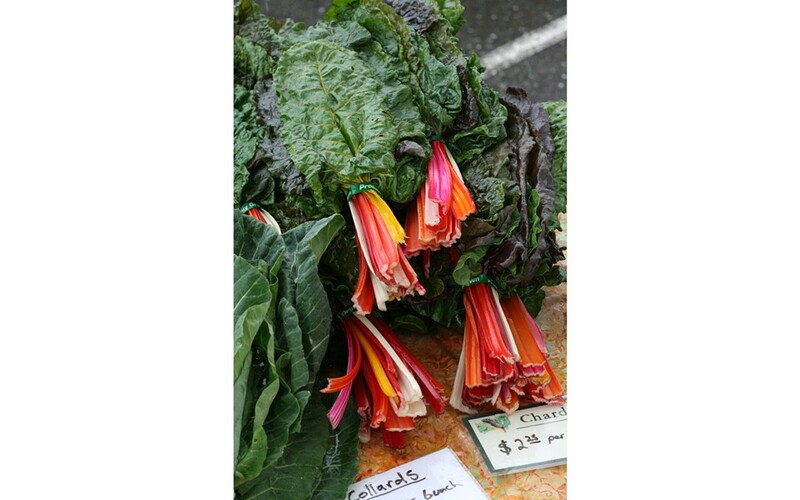 Now is the season of chard. And kale, and beet greens and other tough leafy greens that you planted optimistically a few months ago, thinking, "This will be the year I healthfully gag down mountains of green organic fibrous leaf, thereby cleaning my system and giving my skin the glow of both health and smuggery!" Chard is delicious in its place -- at my 16th birthday party, I dismissed the trad cake in favor of a mountain of steaming and vinegared chard -- no joke -- but between anxiously awaiting the blushing of the tomatoes and taming the last of the artichokes, the deluge of leafy greens can become Niagara-like in its unrelenting cascade. I am no stranger to the sigh of satisfaction as one savors a well-massaged kale salad, or the buttery pile of chard and pine nuts next to your duck breast. Nor am I averse to the glow of self-satisfaction after dutifully choking down undersalted greens as part of a balanced locavore meal. "I grew it, so by God I'm eating it!" you grimly say as you chew your leafy cud. But let's lay the cards on the table. By day umpteenth of trying to wade your way through the accusingly overgrown greens that threaten to envelop the fava beans if you don't eat them, a certain ennui creeps in. Maybe in some dark recess of your heart you secretly hope the slugs might get ‘em. "Oh no!" you say regretfully. "I was going to make another kale omelet, but goshdarn if the snails haven't made holes everywhere! Well, I tried... ." Or of course there's the old going-to-dinner-at-neighbors-house trick. Around this season, the bottle of Pinot Grigio one usually pops over with is supplanted by a stemmy bouquet of chard, brightly brandished like a threat. "Fresh and organic from the garden, tra-la!" you trill as faces fall. Well, fear not, fellow gardeners or children of rabidly gardening mothers. There are a variety of ways the enterprising cook can incorporate greens. I like falafel mixed with finely chopped kale, deep-fried and served with yogurt. My friend Maryanne, mother of Ethan, makes a lovely and easy chard quiche by just mincing steamed salted chard, putting it in a prebaked savory crust, pouring eggs and cream over, topping with cheese and baking covered. Sadly my metabolism won't allow quiche more than weekly, so in fits of desperation fueled by high iron and fiber, I have some suggestions that at the least are new ways of utilizing those leafy greens, be they homegrown or purchased in a moment of weakness at the farmers' market because they're so darn pretty. One has sugar, and the other is lightly fried. If that can't make something palatable then nothing can. This recipe was created by my father and is, to quote, "surprisingly good both flavor- and texture-wise". Wash greens, trim stems and thick ribs. Boil in a little lightly salted water for about 10 minutes, until tender. Drain well (no need to squeeze them absolutely dry) and chop. Combine with egg, crumbs, cheese and seasonings. Form into small patties with your hands and fry gently in olive oil, butter or ghee. Turn once, frying for a total of about 5 minutes. This is a traditional Nicoise dessert from Patricia Well's Bistro Cookbook, and I know it sounds weird but served room temp. on a warm afternoon with some coffee it's light and delicious. My favorite part is the pastry. So simple! I'm tired of racing against the melting of the butter in normal pastry recipes. This dough is hella mellow. Make the pastry: Mix the flour and salt in a medium sized bowl. Stir in 1/2 cup of water and then the oil, mixing until blended. Knead briefly. Divide dough in half and press each half into a round disk. Make the fillin': Wash and dry chard leaves, discarding the toughest bit of the center stem. Tear up the leaves into a food processor and chop finely. This takes me 3 or 4 batches. Combine eggs and raisins in a bowl and mix in chard. Set aside. Roll out 1 disk of pastry into a 10.5 inch circle. Place on bottom of a 10.5 in. tart tin with a removable bottom. You don't need to build up the sides of the tart. Spoon the chard mixture over the dough. Roll out the remaining disk of dough and place it over the chard mixture, tucking the ends of the dough down inside the tart. Bake about 40 minutes, until the crust is golden brown. Remove to a rack to cool. Serve at room temperature, sprinkle with powdered sugar. I prefer a rather heavy sprinkling. Yield: 8 servings, unless everyone is real hungry.